- National Foundation Day October 3, 2333 B.C.E. South Korea, officially the Republic of Korea (ROK), (Korean: 대한민국, IPA: [tɛː.han.min.guk̚]) has existed for nearly 60 years, built on the foundation of a 5,000 year history. Originating from the 1945 American military occupation of the southern half of the Korean peninsula at the end of World War II, South Korea achieved formal independence after United Nations supervised elections in 1948. The Soviet Union had refused to allow UN supervision of elections in the northern half of Korea, which it governed. In the South, Syngman Rhee became the first president of South Korea in August of that year, and the ROK was recognized by the UN as the legal political entity of Korea. The division of the peninsula between North and South solidified after the 1950-53 Korean War, in which the North invaded the South but was repulsed by UN forces. An Armistice remains in effect to date, with the border between the two Koreas roughly following the original 38th parallel that separated the two in 1945. From 1954, and especially since the 1960s, South Korea has prospered, from the devastation of war to an economic and political miracle. 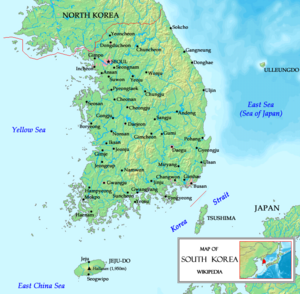 South Korea is an East Asian state on the southern half of the Korean Peninsula. To its north sits North Korea (Democratic People's Republic of Korea), which declared its independence in September 1948. To the west, across the Yellow Sea, lies China and to the south and east, across the Korea Strait (Tsushima Strait) and East Sea (Sea of Japan), is Japan. Approximately one-half of South Korea's population lives in or near the capital, Seoul, the second most populous metropolitan area in the world. Korea traces its founding to 2,333 B.C.E. by the mythological first king, Tangun. Since the establishment of the modern republic in 1948, South Korea struggled with the aftermath of Japanese occupation (1910-1945), the Korean War, and decades of authoritarian governments, undergoing five major constitutional changes. While the government officially embraced Western-style democracy from its founding, presidential elections suffered from rampant irregularities. In 1987, South Korea held its first direct and fair presidential elections, largely prompted by popular demonstrations. South Korea has been a vibrant democracy for two decades. The South Korean economy is now the 12th largest economy in the world. South Korea is also one of the world's most technologically advanced and digitally-connected countries; it is a global leader in electronics, digital displays, semiconductor devices, and mobile phones, as well as in shipbuilding and steel production. Despite Seoul being within North Korean artillery and missile range, the South has been able to gradually realize a remarkably free and open society. In its struggle to develop, South Korea has tended to neglect the traditions of earlier dynasties, emerging into the twenty-first century with an identity crisis. The Joseon dynasty, the last to overlook a free and whole Korea, disappeared, a new identity still waiting in the wings. An identity that will most likely emerge with the reunification of North and South. South Koreans want to see the eventual unification of Korea, but most do not want a hasty one, as the expected burden on the ROK economy would be severe. Apart from the oldest generation, most prefer a gradual unification, in which the North's economy, through assistance from the ROK and international community, is gradually brought closer to that of the South. Regardless of preferences, no one discounts the possibility of an unanticipated, sudden unification. In the Korean language, South Korea is called Daehan Min-guk (Korean:대한민국, Hanja:大韓民國, literally "Great Han People's Nation"), or Hanguk for short (한국, "Han Nation," usually referring to Korea as a whole) or Namhan (남한, "South Han," referring to South Korea specifically). North Koreans refer to the South as Namjosŏn (남조선, "South Chosŏn"). Korea began with the legendary founding of Gojoseon in 2,333 B.C.E. by Dangun. Limited linguistic evidence suggests possible Altaic origins of these people, whose northern Mongolian steppe culture absorbed immigrants and invaders from northern Manchuria, Mongolia, and China. The adoption of the Chinese writing system ("hanja" in Korean) in the second century B.C.E. and Buddhism in the fourth century C.E. had profound effects on the Three Kingdoms of Korea (Goguryeo, Baekje, Silla). 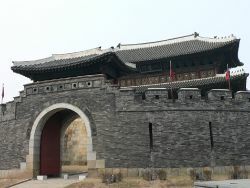 After the unification of the Three Kingdoms by Silla in 676, a single government ruled Korea, maintaining political and cultural independence until the nineteenth century, despite the Mongol invasions of the Goryeo Dynasty in the thirteenth century and Japanese invasions of the Joseon Dynasty in the sixteenth century. In 1377, Korea produced the Jikji, the world's oldest movable metal print document. In the fifteenth century, the Korean navy built and deployed turtle ships, possibly the world's first ironclad warships, and during the reign of King Sejong, scholars created the Korean alphabet, hangul. 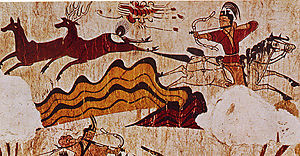 Tomb mural of Goguryeo, one of the three kingdoms of Korea. During the latter part of the Joseon dynasty, Korea's isolationist policy earned it the Western nickname, the "Hermit Kingdom." By the late nineteenth century, the country became the object of colonial designs by Imperial Japan. In 1910, Japan formally annexed Korea and occupied it until the end of World War II, in 1945. The wartime allies of the U.S., Britain, the Soviet Union, and China had agreed on the eventual establishment of an independent and unified Korea in the 1943 Cairo Declaration. However, the U.S. made few plans for Korea's future during the war, other than suggesting a vague notion of multipower trusteeship, and concentrated instead on the defeat of Imperial Japan. Although Truman was painfully aware of the Soviet's seizure of Eastern Europe as Russian forces drove to Berlin, he did not rescind President Franklin D. Roosevelt's prior request that the USSR enter the Pacific theater after the defeat of Germany. Once Japan surrendered, after the American dropping of two atomic bombs in August 1945, Soviet forces had already entered northernmost Korea, as well as Manchuria, days earlier. U.S. military planners judged that Korea should be temporarily divided into two zones of occupation, separated by the 38th parallel, because they argued—perhaps correctly and perhaps not—that it was impossible for American troops alone to accept the surrender of Japanese forces throughout all of Korea due to the distance of the nearest available units. This decision was formalized in General Order No. 1 issued in the name of General Douglas MacArthur, Supreme Commander of Allied Forces Pacific, but approved by President Harry Truman and the other allied leaders. Within three years, however, the Soviet occupation zone had become impermeable, as the well-prepared Russian military methodically set up a local communist government subservient to Moscow. The U.S.-occupation zone, meanwhile, suffered great chaos from internal strife and inept civil administration by an American general ill-equipped for the mission. In 1948, the United Nations agreed to supervise elections in both halves of Korea, but the Soviet zone refused admittance to the UN observers; thus, the UN was only able to supervise elections in the southern zone. The American-educated Dr. Syngman Rhee won the election, and the Republic of Korea was born on August 15, 1948. Months later, the UN recognized the ROK as the sole legitimate government of Korea. Meanwhile, on September 9, 1948, the Democratic Peoples Republic of Korea (DPRK), or North Korea, came into being, with the Soviet-trained Kim Il-sung becoming premier. On June 25, 1950, the North attacked the South in an attempt at forceful reunification. The attack was planned by the Soviet military, with tacit communist Chinese support, but was carried out by North Korean military forces, signaling the beginning of a bloody international and civil war that caused the deaths of more than four million civilians and soldiers. United Nations forces, composed of troops from sixteen member nations, intervened on behalf of South Korea when it quickly became apparent that the better equipped and trained North Korean forces would soon overrun the country. The Soviet Union and China backed North Korea, with China eventually dispatching millions of troops across the border, while the Soviets provided supplies. The Korean War reached a stalemate within its first year. In July 1953, an armistice was signed by the U.S. (on behalf of UN forces), China, and North Korea. South Korea would not sign, but agreed to abide by it in exchange for a mutual security pact with the U.S. The armistice remains in effect today, technically still leaving the two Koreas in a state of war. In 1960, a student uprising led to the resignation of president Syngman Rhee, whose government had become autocratic and corrupt. Then followed a period of profound civil unrest and general political instability. General Park Chung-hee led a military coup (the "5.16 coup d'etat") against the weak and ineffectual government the following year. Park was president from 1961 until his assassination in 1979, overseeing rapid export-led economic growth but severe political repression as well. The year following Park's death, previously repressed opposition leaders clamored to run for president, causing considerable political turmoil. In 1980, General Chun Doo-hwan launched a coup d'etat against the transitional government of interim president Choi Gyu Hwa, to assume the presidency. Chun's seizure of power triggered national protest calling for democratization, particularly protests in Gwangju, South Cholla province. Chun sent in special forces to suppress the city, brutally killing many students and civilians in what is known as the Gwangju Massacre. Chun stated his intent to serve only a single term from the outset and eventually allowed direct presidential elections in 1988, under pressure from widespread popular demonstrations. That year, Seoul hosted the 1988 Summer Olympics, representing a coming of age, much as the 1964 Tokyo Summer Olympics did for Japan. Chaebols, family-owned business conglomerates, drove South Korea's explosive economic development. Some of the largest and best-known chaebols include Samsung, LG, and Hyundai. In 1996, South Korea became a member of the Organization for Economic Co-operation and Development (OECD). Despite a severe setback caused by the Asian financial crisis of 1997-98, the country re-emerged as a major economic power. In 2004, South Korea joined the "trillion dollar club" of world economies and, today, its standard of living approximates that of European Union members Portugal and Spain. In June 2000, as a part of South Korean president Kim Dae Jung's Sunshine Policy of engagement with North Korea, the first and only North-South summit took place with North Korean leader Kim Jong-il, in Pyongyang. That year, Kim won the Nobel Peace Prize for his work for democracy and human rights and efforts at reconciliation between the two Koreas. South Korea is one of the four so-called Asian Tigers, along with Hong Kong, Taiwan, and Singapore. The government of the Republic of Korea is divided into three branches: Executive, judicial, and legislative. 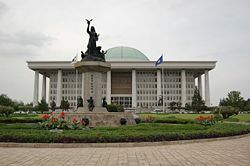 The executive and legislative branches operate primarily at the national level, although various ministries in the executive branch also carry out local functions. Provincial and local governments act semi-autonomously, and have executive and legislative bodies of their own. The judicial branch operates at both the national and local levels. The Constitution of the Republic of Korea provides for the national governmental structure. Although the Constitution has been revised several times since 1948 (see History of South Korea), its characteristics have remained the same. With the exception of the short-lived Second Republic of South Korea, the country has had a presidential system with a relatively independent chief executive. As with most stable three-branch governments, a system of checks and balances is in place. For instance, the executive and legislative branches share in the appointment for the judges of the Constitutional Court. Likewise, the legislature sends passed resolutions of impeachment to the judiciary for a final decision. However, the President, who presently serves a single five-year term, is generally considered by far the most powerful branch of the ROK government. 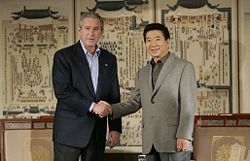 U.S. President George W. Bush and South Korean President Roh Moo-hyun at the 17th APEC meeting. South Korea's foreign relations have been primarily concerned with North Korea and its neighbors China, Japan, and Russia, as well as its main ally, the United States. The United States has been the primary driver in the establishment and initial support of the South Korean government since the Korean War. Since the 1990s, the two allies have successfully managed differences in their policies towards North Korea, despite divergent national interests regarding the North, and more recently, an anti-American flavor to the present ROK administration. Overall, South Korea has been steadily moving to take responsibility for major policy decisions affecting its own fate. South Korea and China established formal diplomatic relations in August 1992, despite the legacy of the Korean War; today, China is the ROK's largest trading partner. South Korea and Japan signed a normalization agreement in 1965, with Japan providing compensation for its 35 years of occupation. 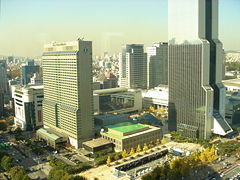 South Korea's relations with Japan have been cooperative with the exception of several unsettled disputes, many of which stem from the period of occupation. Japan conscripted more than 100,000 Korean civilians as soldiers. Longstanding issues such as Japanese war atrocities against Korean civilians, the visits by Japanese politicians to the Yasukuni Shrine, honoring convicted war criminals, the re-writing of Japanese textbooks to overlook Japanese aggression during World War II, and the territorial disputes over Liancourt Rocks (known as Dokdo in Korean, Takeshima in Japanese) continue to trouble Korean-Japanese relations. Both North and South Korea continue to officially claim sovereignty over the entire peninsula. Despite longstanding animosity following the Korean War, the South and North have in recent times occasionally established a more conciliatory relationship. Events such as family reunions and international athletic competitions, where the two Koreas enter the opening ceremonies together but still compete as separate teams, show the possibility of a gradual thaw in the North-South relationship. However, North Korean missile tests, its October 2006 nuclear test, and disputes over sea boundaries, among other factors, have chilled progress toward reconciliation. South Korea maintains diplomatic relations with approximately 170 countries. The country has also been a member of the United Nations since 1991, joining at the same time as North Korea. On January 1, 2007, former South Korean Foreign Minister Ban Ki-moon assumed the post of UN Secretary-General for a five-year term. Also, Korea has developed strong ties with ASEAN, the Association of Southeast Asian Nations, as both a member of "ASEAN + Three" and the East Asia Summit. It also participates in ASEM, the Asia-Europe Meeting and in APEC, the Asia-Pacific Economic Cooperation. South Korea's military is composed of the Republic of Korea Army (ROKA), Republic of Korea Navy (ROKN), Republic of Korea Air Force (ROKAF), and Republic of Korea Marine Corps (ROKMC), together with reserve forces. Many of those forces are concentrated near the border—the demilitarized zone—with North Korea. All South Korean males are required to serve in the military, typically for a period of twenty-four months. From time to time, South Korea has sent troops overseas to assist American-led coalitions, participating in every major conflict the United States has led since the Korean War. South Korea dispatched 320,000 troops to fight alongside American and South Vietnamese soldiers in the Vietnam War, with a peak strength of 50,000. Most recently, South Korea sent 3,300 troops in the form of the Zaytun Division to fight in northern Iraq, and is the largest contributor of troops during the most recent Iraq conflict, after the U.S. and Britain. The United States has stationed at least one division in the ROK since the Korean War at bases and camps throughout the country. Approximately 28,000 U.S. soldiers presently serve in South Korea, down from 36,000 in recent years. The ROK maintains an active duty military force of approximately 680,000, ranked 8th largest in active duty size in the world. Only the United States has more Marines than South Korea. South Korea occupies the southern portion of the Korean Peninsula, extending approximately 680 miles (1,100 km) from the Asian mainland. A mountainous peninsula, the Yellow Sea flanks Korea to the west, and the Sea of Japan to the east. The Korea Strait and the East China Sea touches the southern tip of the peninsula. The country's total area is 38,462.49 square miles or 99,617.38 square kilometres. General map of South Korea. 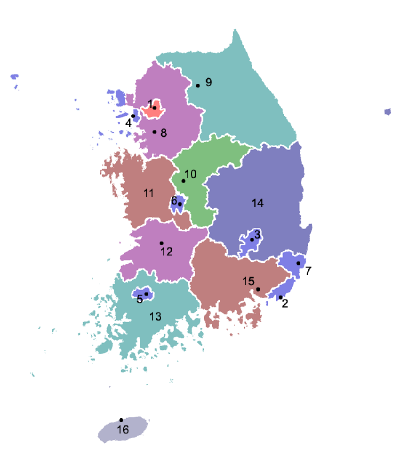 South Korea naturally divides into four general regions: An eastern region of high mountain ranges and narrow coastal plains; a western region of broad coastal plains, river basins, and rolling hills; a southwestern region of mountains and valleys; and a southeastern region dominated by the broad basin of the Nakdong River. South Korea's land is largely mountainous Lowlands, located primarily in the west and southeast. About three thousand islands, mostly small and uninhabited, lie off the western and southern coasts. The country's largest island, with an area of 1,845 square kilometres (712 sq mi), Jeju Island sits about 100 kilometers (about 60 mi) off the southern coast of South Korea. Jeju is also the site of South Korea's highest point: Halla-san, an extinct volcano, reaches 1,950 meters (6,398 ft) above sea level. Other islands of South Korea include Ulleungdo and the disputed Liancourt Rocks (Dokdo). The local climate is relatively temperate, with precipitation heavier in summer, during a short rainy season called jangma. Winters can be bitterly cold. In Seoul, the average January temperature range is -7°C to 1°C (19°F to 33°F), and the average July temperature range is 22°C to 29°C (71°F to 83°F). Winter temperatures range higher along the southern coast and considerably lower in the mountainous interior. Rainfall concentrates in the summer months of June through September. Late summer typhoons bring strong winds and heavy rains frequently to the southern coast. The average annual precipitation varies from 1,370 millimeters (54 inches) in Seoul to 1,470 millimeters (58 inches) in Busan. South Korean won banknotes and coins. South Korea is a major international economic power with the twelfth largest economy in the world (eleventh largest by purchasing power parity) and the third largest in Asia, behind only Japan and China (fourth behind China, Japan, and India by purchasing power parity). 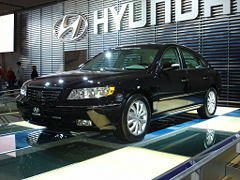 Hyundai is one of the Korean Big Four. At the end of World War II, Korea had inherited a colonial economic system designed for Japan's needs. In addition, the Korean War destroyed much of the country's infrastructure. After the war, South Korea became heavily dependent on U.S. aid. Following the military coup led by Park Chung-hee, South Korea embarked on a series of ambitious five-year plans for economic development. Emphasis shifted to foreign trade with the normalization of relations with Japan in 1965, and resulted in a boom in trade and investment. Rapid expansion, first into light and then heavy industries, followed in the 1960s and 1970s. During that period, the South Korean economy grew at an average annual rate of 8.6 percent. That phenomenal growth earned the title "Miracle on the Han River," the main river that runs through the capital and largest city, Seoul. In the 1980s and 1990's, rocketing growth continued as South Korea transformed itself from an exporter of mostly textiles and shoes into a major global producer of automobiles, electronics, shipbuilding, steel, and, later, high-technology products such as digital monitors, mobile phones, and semiconductors. The South Korean model of encouraging the growth of large, internationally competitive companies through easy financing and tax incentives led to the dominance of the family-controlled conglomerates. Those companies, known as chaebol, flourished under the support of the Park regime. Some, such as Hyundai, Samsung, LG, and SK Company, became global corporations. In 2004, South Korea joined the trillion dollar club of world economies. Since the Asian financial crisis of 1997-98, the corporate landscape changed considerably after massive bankruptcies and government reforms. The crisis exposed longstanding weaknesses in South Korea's economy, including high debt-to-equity ratios, massive foreign borrowing, and an undisciplined financial sector, along with collusion between government and chaebols. That led to two rounds of financial and industrial restructuring; once in 1997 and again following the collapse of Daewoo in 1999. By 2003, just over one-half of the 30 largest chaebol from 1995 remained. Moderate inflation, low unemployment, an export surplus, and fairly equal distribution of income characterizes the South Korean economy. South Korea continues to strive to maintain global competitiveness, although the country has been reluctant to open the job market to foreigners. A KTX train stationed at Songjeongni station. An extensive network of railways, highways, bus routes, ferry services, and air routes criss-crosses the country. All cities have intercity and intracity bus systems. Major cities also have express bus terminals. Highways in South Korea are classified highways (expressways/motorways), national highways, and various classifications below the national level. Korea Highway Corporation operates the toll highways and service amenities en route. South Korea has about 3,000 kilometers of national highways. Most tourist and freight transportation use highways. Korail provides frequent train service to all major South Korean cities. Two rail lines, Gyeongui and Donghae Bukbu Line, to North Korea are now being reconnected. 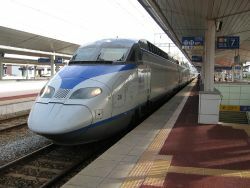 The Korean high-speed railway system, KTX, provides frequent high-speed service along Gyeongbu and Honam Line. Major cities have subway systems, including the popular Seoul Subway. Korail commuter lines are already linked with the Seoul subway system and several commuter lines connected with Busan, Daegu subway system are under construction. The main international airport is Incheon International Airport. South Korea has eight international airports and seven domestic airports. South Korea's international air carriers are Korean Air and Asiana Airlines. About 70 international passenger and cargo airlines operate frequent flights between Korea and many nations throughout the world. Most South Koreans live in urban areas, due to migration from the countryside during the country's rapid economic expansion in the 1970s, 1980s, and 1990s. The capital city of Seoul is also the country's largest, and chief industrial center, with 10.3 million inhabitants in 2006, making Seoul one of the most populated single cities in the world. Other major cities include Busan, Incheon, Daegu, Daejeon, Gwangju, and Ulsan. The population has also been shaped by international migration. Following the division of the Korean peninsula after World War II, about four million people from North Korea crossed the border to South Korea. That trend of net entry reversed over the next forty years due to emigration, especially to the United States and Canada. South Korea's burgeoning economy and improved political climate in the early and mid-1990s slowed the high emigration rates typical of the previous decade. Many of those who left the country even returned. Although small, the percentage of non-Koreans in South Korea has risen in the early twenty-first century. The foreign workforce mainly comes from South Asian and Southeast Asian nations, although many workers from the former Soviet Union countries as well as some from Nigeria have entered. In addition to those workers, about 11,000 expatriate English teachers and around 31,000 U.S. military personnel live and work in Korea. Approximately 22 million Koreans, close to half of the South Korean population, express no religious preference. Of the remainder, 10.7 million are Buddhist, 8.6 million are Protestant, 5.1 million are Catholic, and less than half a million belong to various minor religions including Jeungsando and Wonbuddhism. The largest Christian church in South Korea, Yoido Full Gospel Church, is located in Seoul and has approximately 780,000 members (2003 estimate). Including Yoido Full Gospel, eleven of the world's twelve largest churches are located in Seoul (see Korean Christianity). South Korea is also the second largest missionary-sending nation on earth, after the U.S. Forty-five thousand Muslim believers reside in Korea, as well as approximately 100,000 temporary workers from Muslim countries. The two Koreas have developed distinct contemporary forms of culture since the division of the Korean peninsula in 1945. The South Korean Ministry of Culture and Tourism actively encourages the traditional arts, as well as modern forms, through funding and education programs. Korean art and culture have developed and transformed through cultural influences from many countries. Prior to the nineteenth century, cultural infusions came primarily from China. Koreans adapted many Chinese art forms with innovation and skill, creating distinctively Korean pieces. For many centuries, Korean forms of metalwork, sculpture, painting, and ceramics flourished throughout the Korean peninsula, passing them on to neighboring countries like Japan. In modern times, Western, and particularly American, influences have been strongest, accented by influence from Europe, especially Germany. In the aftermath of the Japanese occupation, the Korean government had sought to restrict Japanese cultural influences until 1999. Recently, Japanese influences have been particularly controversial; for example, the K-pop singer Hyori sparked a national controversy. In recent times, Korean pop culture has become popular in Asia and beyond, earning the name Hallyu or "Korean Wave." Korean pop culture has also made headway in Japan, with Korean singers like BoA, and television dramas like Daejanggeum and Winter Sonata finding success. Recent Korean films such as Oldboy, Oasis, and others have also received international acclaim. Technology, including feature-rich cell phones and pervasive online gaming, heavily dominates the contemporary culture of South Korea. South Korea today has one of the highest expansions of high-speed internet access to households in the world. Digital multimedia broadcasting now allows South Koreans to watch television on their cell phones. South Korea's entertainment industry has grown substantially since the 1990s, producing Asia-wide successes in music, television, and film. South Korea nonetheless still retains centuries-old customs and traditions, such as its unique cuisine and ancestor worship. 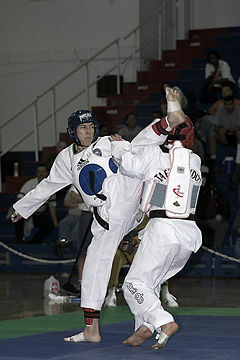 Taekwondo, a popular martial art, originated in Korea. Taekwondo roughly translates to "the way of punching and kicking," although sometimes translated as "the way of the hands and feet." The South Korean military incorporates taekwondo into military training, while taekwondo became an official Olympic sport in 2000. Other Korean martial arts include subak and taekkyeon. Baseball, first introduced to Korea in 1905 by American missionary Phillip Gillette, has become the most popular spectator sport in South Korea. The Korea Baseball Association, established in 1982, became the first South Korean professional sports league. During the 2006 World Baseball Classic, South Korea reached the final four before losing to Japan. Prior to that final match, the South Korean team had been the only undefeated team, beating Japan twice and the United States once. Other popular sports in South Korea include basketball, football, golf, tennis, and ice hockey. Women's golf is especially strong, with forty-five South Koreans playing on the world's leading women's tour, the U.S. LPGA Tour, including stars such as future Hall of Famer Se Ri Pak. South Korea's Olympic teams have also traditionally performed at a championship level in archery, shooting, badminton, table tennis, fencing, weightlifting, boxing, judo, short track speed skating, marathon, taekwondo, kumdo, wrestling, as well as handball and field hockey. In 1988, South Korea hosted the Summer Olympics in Seoul. Korea has conducted an ongoing campaign to have a future Winter Olympics held in Pyeongchang County. South Korea has hosted the Asian Games in 1986 and 2002. In football (soccer), South Korea and Japan co-hosted the 2002 FIFA World Cup, and South Korea became the first Asian team to reach the semi-finals. The Korea Republic national football team, also known as the "Taeguk Warriors," qualified for the 2006 FIFA World Cup in Germany for their sixth consecutive World Cup. South Korea is also home for the invitation-only Peace Cup for international men's and women's professional football clubs. During the 2006 Winter Olympics in Turin, the South Korean short track team dominated their event, taking home six of the eight gold medals available as well as three silvers and one bronze. Skaters Ahn Hyun Soo and Jin Sun-Yu became the second and third persons in the Games to win three gold medals. ↑ 1.0 1.1 1.2 1.3 Central Intelligence Agency, Korea, South World Factbook. Retrieved May 29, 2017. ↑ Population Projections for Provinces (2013~2040) (PDF). Statistics Korea (April 16, 2016). Retrieved May 29, 2017. ↑ Major Indicators of Korea. Korean Statistical Information Service. Retrieved May 29, 2017. ↑ 4.0 4.1 4.2 4.3 South Korea. International Monetary Fund. Retrieved May 29, 2017. ↑ Jeremy Norman, The Earliest Surviving Book Printed from Movable Metal Type (1377) HistoryofInformation.com. Retrieved March 28, 2017. ↑ U.S. Department of State, South Korea. Retrieved March 28, 2017. ↑ One Free Korea, Anti-Americanism in Korea—The Statistical Record. Retrieved March 28, 2017. ↑ Cumings (1997), 305-307; Nahm (1996), 448. ↑ Cumings (1997) chapter 6. ↑ CIA Country Studies, South Korea. Retrieved March 28, 2017. ↑ World Atlas, World City Populations. Retrieved March 28, 2017. ↑ Christianity Today, Korean Christian missionaries. Retrieved March 28, 2017. ↑ Islam Awareness, Islam takes root and blooms. Retrieved March 28, 2017. ↑ Ipsos News Center, Internet Adoption Slowing—But Dependence on it Continues to Grow. Retrieved March 28, 2017. A Country Study: South Korea in the Library of Congress. This page was last modified on 29 May 2017, at 23:32.